Days of Our Lives Recap: Bonnie Places Her Fate in the Hands of "Big Daddy Horton"
We open up today with Lucas, Bonnie, Sheila and the precious cargo. Bonnie is eating this up! She asks little Bonnie, Jr. if she would like to meet her daddy. Lucas looks as pale as he did when he found out Sami had lied to everyone about Austin being Will&apos;s daddy! In the park, Will&apos;s lamenting about Paul&apos;s condition. Sonny believes that he and Will need to be there for Paul . . . but not before he brings up that he and Will are back together again. Over at the hospital, Kayla is breaking what appears to be not so good news to Paul. Kayla is explaining to him that saving Sami&apos;s life and crashing through that window with Kristen, wrecked his spinal column . . . Will Paul ever walk again? 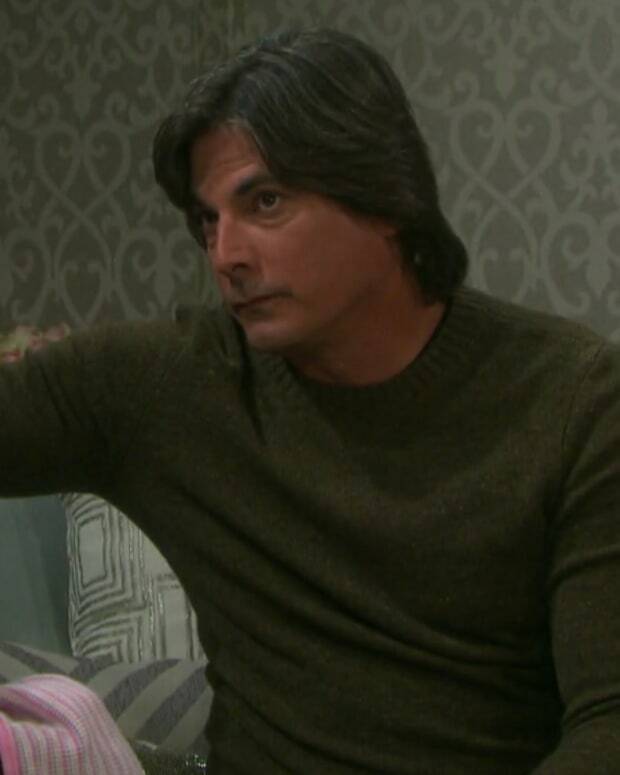 Meanwhile, John is asking Belle and Eric what they need to tell him about Marlena. Eric explains that nothing has changed. Belle hands John the living will and says the machines have to be turned off. John raises his eyebrow and asks Belle where she got this paperwork - you can tell he&apos;s revving up for a fight with his blood daughter. Eric tries to back her up as Belle goes all lawyer on John. She tells him the papers were executed legally and these are her mama&apos;s wishes. John is having none of it. Towards the end of today&apos;s episode, Bonnie continues to plead with Lucas to believe her that Sheila&apos;s precious cargo is his baby . . . but more importantly, time is a-tickin&apos; and he needs to get her out of this nonsense that will separate them. Lucas looks like he would probably be cool with that as he storms out the door and Bonnie rolls her eyes. Lucas runs into Sheila, who asks if he wants to hold the baby. Sheila informs little Bonnie, Jr. that she is SOL. Sheila goes back in to talk to Bonnie and seems somewhat skeptical about this baby she had her pickup . . . and she called Lucas, "Big Daddy Horton." I. LOVE. SHEILA. Back in the park, Will has news about Paul. Sonny has already heard that Paul won&apos;t be walking anywhere anytime soon. Will tells Sonny he told Paul he would be there for him. However, Will&apos;s torn because he still wants to be with Sonny. Will says it doesn&apos;t have to be the end for them. Sonny answer with, "yes it does." Wait, did Sonny just step up and do the right thing? Just as I was about to write a snarky comment about WilSon?What? Just when I think I know what those sneaky writers are going to do, they throw me a curve ball. Well played. Back at the hospital, John comes to visit Paul and looks pained . . . probably because his son and his once wife/almost wife are all banged up. John looks skyward, embracing his helplessness . . . but not quite yet. He unbuttons his top button, rolls up his sleeves, and gets ready to fight for his family. Wow, Paul must be in a really deep sleep as John is just manhandling him. In the waiting room, Jennifer wants to talk to Eric about something really important. What could it be? Back in her office, Kayla is calling Roman to see if he has spoken to Shane. Have they been able to locate Steve? She&apos;s very worried about her Steve and his bionic eye. Where is he? But wait, in walks a very tearful Belle, who needs to talk to Kayla about Marlena. She&apos;s clutching that damned living will. That&apos;s it! We&apos;ve come to the end of yet another episode. What did you think? What stood out to you? What do you think will happen next? Sound off in the comments! DAYS Recap: Big Daddy Horton Takes off with Baby Bonnie . . . and Mama Mimi is PISSED!